(L-R) The IAHPC delegation — Dr. Sébastien Moine, Mrs. Gulnara Kunirova, Dr. Katherine Pettus — and Dr. Santiago Correa from Madrid. 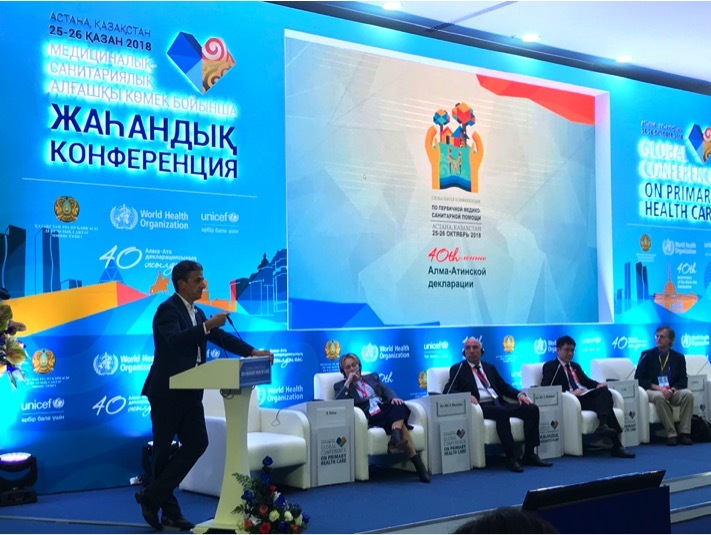 On 25-26 October 2018, United Nations member states and representatives of civil society organizations, such as IAHPC, came together in Astana, Kazakhstan, at the Global Conference on Primary Health Care (PHC) to renew a commitment to primary health care to achieve Universal Health Coverage (UHC), and the Sustainable Development Goals (SDGs). The conference was co-hosted by the Government of Kazakhstan, WHO, and UNICEF. 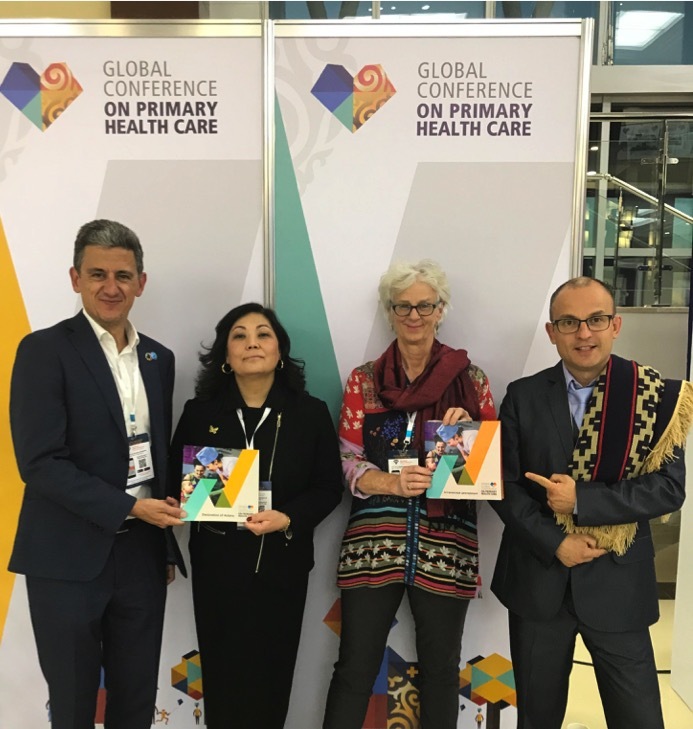 The IAHPC delegation comprised Dr. Sébastien Moine (EAPC and Edinburgh University), Mrs. Gulnara Kunirova (Kazakhstan Palliative Care Association), and myself. We attended as many of the plenary sessions and breakout sessions as we could, raising the issue of palliative care wherever possible and appropriate. The original (‘zero draft’) of the Declaration, circulated for public comment earlier this year, omitted to mention palliative care, as do so many of the high-level global health documents that focus exclusively on the new mantras of disease prevention, health promotion, and ‘control.’ To its credit, the WHO opened up the draft for public comment, allowing organized advocacy by the global palliative care community to ensure inclusion of the magic words in the final document. Situating palliative care within the PHC spectrum as a platform for Universal Health Coverage (UHC), as the Declaration does, gives palliative care providers excellent leverage to advocate for programs with their country’s ministers of education, health, and finance. IAHPC will be working with partners through a community of practice to develop practical policy tools to aid members in their advocacy. I will be designing an advocacy program in collaboration with IAHPC partners to help our membership carry these goals forward in the new year. Intensified collaborations between national palliative care associations and government ministries, as governments will not be able to implement PC policies on their own. It is important for members of national PC associations to develop relationships with relevant departments if they have not already done so. Intensified collaborations between Ministries of Health and the ministries that regulate ‘narcotic drugs’ to ensure rational access to internationally controlled essential medicines for palliative care. IAHPC can provide recommendations on this. Intensified primary care workforce education and training, from the community to the tertiary levels, in palliative care principles and practice. IAHPC and regional PC associations can provide guidelines and curricula. Intensified development of multidisciplinary professional collaborations to improve quality of life for patients and families by reducing health-related suffering. It was a great honor for me to moderate a Ministerial Session on ‘Palliative Care in Primary Health Care’ as understudy for Dr. Felicia Knaul, who was unable to attend the Astana conference. The panel featured Dr. Veronika Skvortsova (Minister of Health, Russian Federation), Dr. Alisher Shadmanov (Minister of Health, Uzbekistan), and Dr. Benjamin Koh (Deputy Secretary of Health, Singapore). Drs. Eric Krakauer and Sébastien Moine gave expert presentations on the Lancet Commission Report and the primary care provider perspective, respectively, while Ms. Lucy Watts, MBE, provided the patient perspective through a video link from the UK. 5) tools for quality monitoring. Dr. Sébastien Moine discusses the primary care perspective at the Ministerial Session on palliative care. As our own ministerial session and the conference as a whole showed, the global public conversation around palliative care as an essential service is developing and maturing. But the work to secure the promises of the new Declaration is just beginning. This poses an exciting challenge that IAHPC and our membership must be prepared to meet in the coming decade. 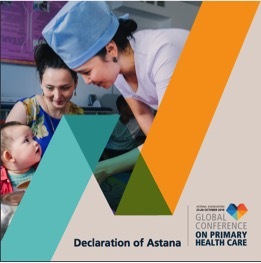 I encourage all of you to study the Astana Declaration, which will contribute to the United Nations General Assembly high-level meeting on Universal Health Coverage next September. IAHPC will begin working with our membership and developing community of practice to help you prepare your national delegations for that meeting, and to build a strong advocacy platform for our own delegation. We encourage interested readers to start looking for funding now if they wish to attend the UN meeting in September 2019. Editor’s Note: A recently published blog by Dr. Pettus addresses the same topic; below is a sampling and a link to the full text. Palliative care ticks all the #AlmaAta40 #Astana2018 boxes. It is a recognized element of primary health care, an essential service under UHC, an engine for at least five goals of the 2030 Agenda for Sustainable Development Goals, and is human rights friendly.